Observation - Red tree fungus - UK and Ireland. 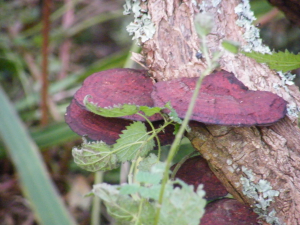 Description: Deep red bracket fungus. Spotted at Slapton Ley nature reserve, S Devon. Didn't note the tree species, but in very wet, marshy ground. Deep red bracket fungus. Spotted at Slapton Ley nature reserve, S Devon. Didn't note the tree species, but in very wet, marshy ground.